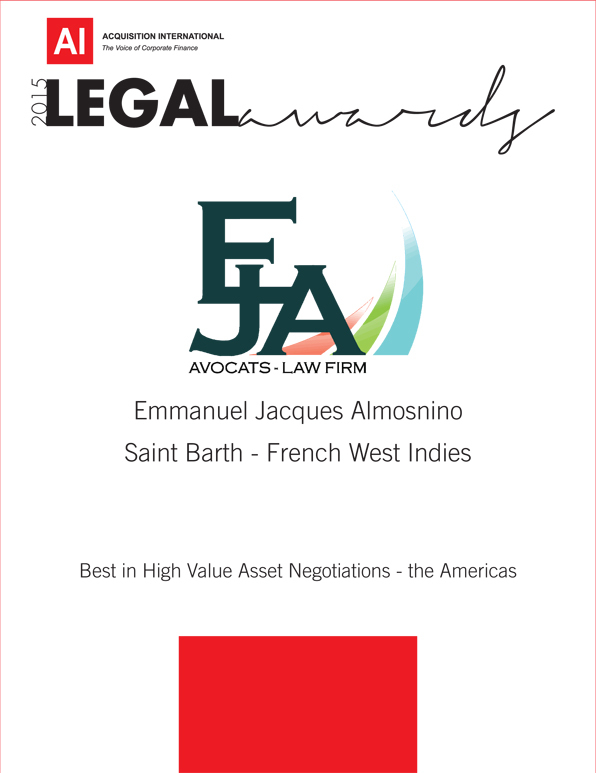 Acquisition International (AI) named Emmanuel Jacques Almonsnino Saint Barth - French West Indies Best in High Value Asset Negotiations - The Americas. AI awards are given to commend outstanding work throughout the legal world over the past 12 months, recognizing excellence in all areas of the industry, from commerecial litigation and arbitration to immigration law, insolvency, intellectual property and many more. Law firms are nominated by clients, peers and fellow professionals, voted for by AI subscribers and agreed by AI industry experts. The Legal Awards provide a comprehensive go-to resource for those seeking the truly outstanding legal professionals from around the world.